Over 40 days, discover the Rockies, Alaska & Canada with highlights including a glacier discovery cruise, Niagara Falls & Rocky Mountaineer rail journey. This morning visit the world-famous Butchart Gardens. Learn about the history and flora while exploring the colourful gardens. Afterwards enjoy an orientation tour of Victoria. Drive along Vancouver Island to Nanaimo. Board the BC Ferry and travel through the Georgia Strait to Horseshoe Bay. Journey along the Sea to Sky Highway to the charming alpine resort of Whistler. Travel the scenic Duffy Lake Road into the town of Lillooet. Head to the picturesque ski resort of Sun Peaks. You’re Invited: Enjoy a fur trader’s feast and presentation accompanied by a tranquil canoe journey. Morning sightseeing tour including Bow River, the Hoodoos and Bow Falls. On the way to Emerald Lake see the ‘Diamond in the Wilderness’, Lake Louise and the spectacular Natural Bridge. Emerald Lake is so called due to the vibrant turquoise colour of its waters which is surrounded by majestic peaks. Today is yours to enjoy your authentic Rockies lodge and the spectacular surroundings. Set off on “The Most Spectacular Train Journey in the World”. Settle back in your SilverLeaf carriage (upgrade to GoldLeaf at additional expense) and enjoy incredible views of the soaring mountains including Canada’s highest peak, the 3954 metre Mount Robson. Continue our journey on the Rocky Mountaineer following the Thompson River and passing into the Fraser Valley. Late afternoon arrival into Vancouver. Set-off on a sightseeing tour of Vancouver including Stanley Park, the waterfront and Gastown. Make your way across the Capilano Suspension Bridge suspended 70 metres above the river, then walk amongst the canopy on the Treetops Adventure. Finish with an enthralling visit to the 4D virtual reality experience of FlyOver Canada. This morning board your luxurious cruise ship. Check into your Outside Stateroom on the Holland America ms Westerdam and settle-in for an unforgettable 7 night voyage through the famed Inside Passage. Spend the day cruising the Inside Passage, one of the world’s most spectacular waterways. Welcome to the salmon capital of the world! Part of the town is built along a steep hillside, part is built on pilings over the water. Surrounded by the Gastineau Channel, the Mendenhall Glacier and Juneau Icefields, Alaska’s capital is famed for its scenery and isolation. Established in 1897 as a trading post for prospectors headed to the Klondike Gold Rush, Skagway’s colourful past is carefully preserved in the Klondike Gold Rush National Historic Park. Enter the iceberg-strewn waters of Glacier Bay National Park, where spectacular glaciers flow into the bay. A National Park Ranger will help you spot wildlife, while explaining glacial activity. Take advantage of the ship’s many outstanding facilities, or simply watch the scenery glide by. Disembark in Seward and enjoy a scenic rail journey aboard the cruisetrain. Glaciers, canyons, waterfalls and spectacular scenery await at every turn. On arrival in Anchorage be taken on a tour of the points of interest of the downtown area. Head to Portage and take a cruise to Portage Glacier for fantastic views of the blue-white icebergs that decorate the lake. Travel to the Alaska Wildlife Conservation Centre which is a refuge for orphaned and injured wildlife. Get our first taste of the vast natural beauty of Alaska as we travel north from Anchorage to Denali State Park. Visit the quaint and quirky town of Talkeetna and if you’re lucky, catch a glimpse of impressive Mt. Denali. Relax and soak up the surroundings on board the full-dome McKinley Explorer to Denali National Park. This evening is a Music of Denali Dinner Show. Denali is deep in the Alaskan wilderness and this unique location gives you the opportunity to witness the fascinating landscape and wildlife. Embark on a Tundra Wilderness Tour which takes you into the park for a once in a lifetime experience. You’re Invited: In the morning visit Husky Homestead, home of four-time Iditarod Champion Jeff King. Enjoy a warm welcome and take an authentic look into rural Alaskan lifestyle while getting to know a champion Iditarod team. Continue your journey into the heart of the last frontier, Fairbanks. Known as the “Golden Heart City”, Fairbanks has a prominent Gold Rush history. Learn of Alaska’s gold mining history. View the Trans Alaska Pipeline, then board a replica of the Tanana Valley Railroad to Gold Dredge 8. In the afternoon board an authentic sternwheeler for a unique cruise along one of Alaska’s great rivers. Fly to Dawson City. Dawson was the heart of the Klondike Gold Rush and is now a National Historic Site. Tour historic Dawson City and see some of the original gold rush era buildings. Head to Gold Dredge No. 4 and Discovery Claim where the first gold was discovered. In the afternoon cruise on the only operating paddle wheeler in the Yukon. Travel via the Klondike Highway to Whitehorse. This journey loosely follows the original overland route to the goldfields first used in 1902. On arrival, see the S.S. Klondike National historic site. Explore the MacBride Museum. You’re Invited: See what it takes to be a competitive musher at the home of Yukon Quest legend Frank Turner. Learn how integral dog sledding is to the Yukon history, then be served a home-cooked lunch to round off this authentic Yukon experience. Tonight, enjoy a farewell dinner. Transfer to Whitehorse Airport for your flight to Vancouver (flight not included in price, day is unescorted). Fly to Toronto (flight not included in price). On arrival you will be met and transferred to your hotel (day is unescorted). Spend the day exploring the city of Toronto. 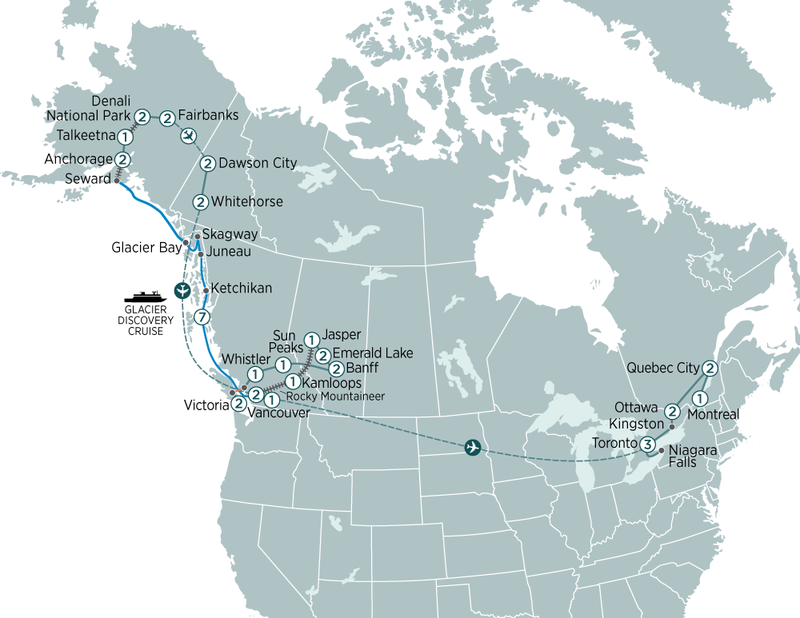 This spectacular 44 day journey includes 2 luxury cruises, a 12 day Canadian Rockies tour, 6 day Alaskan Wilderness experience & 8 day Eastern Canada tour. Discover the Rockies, Alaska, Canada & East Coast USA. From glaciers to national parks, cosmopolitan capitals & rail journeys - this holiday is unforgettable. Starting in Toronto, visit Niagara Falls, Ottawa, Quebec & Montreal. Highlights include a picturesque Kingston cruise & a gastronomic walking tour in Quebec.